Professional sports stadiums put a strain on transportation networks. While good transit service to games can lessen the traffic burden and help everyone get to sports venues more easily, this often imposes additional costs on transit agencies. Despite all the public subsidies pro sports teams receive, they rarely help pay for this service. It doesn’t have to be this way, says Richard Layman at Rebuilding Place in the Urban Space. 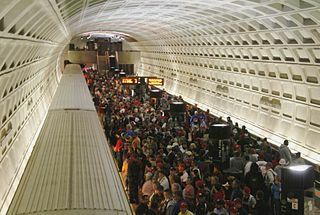 Layman reports that, of DC’s NFL, NBA, NHL, and MLB teams, only the basketball and hockey arena has an agreement to pay WMATA for added transit service necessitated by games. The Washington Nationals have refused to put such an agreement in place, despite the city’s preference that they do so and the fact that the city is paying hundreds of millions of dollars for the team’s stadium. The city didn’t put a provision for transit coverage in the contract so the Nationals, see no reason to do so. The result, says Layman, is uneven transit service to and from games, which is frustrating for fans who can’t or don’t want to drive. It also puts the onus on WMATA to accommodate the teams — which, as Layman notes, may already benefit from taxpayer subsidies. Layman recommends that cities include “transportation demand management requirements” in stadium contracts, and zone for stadium construction only in areas already served by transit. Of course, many communities are so eager to get a team that transit service and station adjacency ends up being, at best, an afterthought. For example, the Atlanta Braves baseball team is moving out of the city to the suburbs, to the Galleria district of Cobb County, located at the intersection of I-285 and I-75, which is an area not served at all by MARTA’s heavy rail transit system. Elsewhere on the Network: Spacing Toronto tours rail stations that were built and never used, and TheCityFix looks at the growth of bike-share systems worldwide.